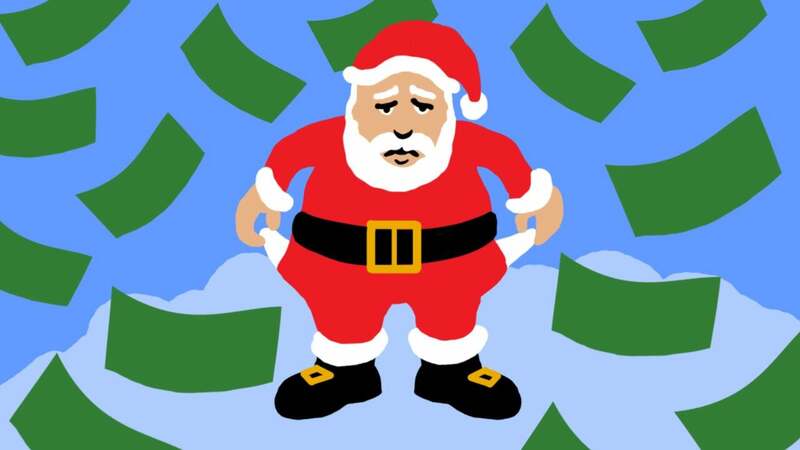 Santa is gone, the decorations are down, and chances are, you're feeling the sting of your holiday spending. If it crept up on you, your budget is strained, and now you're worried about your finances, you'll want to come up with a plan to recover. Photo by Nick Criscuolo. Before anything else, you want to know what you're working with and how to fix it. Calculate your recovery amount. These are just examples, but the point is: add it all up. Consider every expense that went beyond your budget or usual spending, then come up with a solid number that indicates how much you're in the hole. After you've crunched the numbers and know what you're dealing with, it's time to rein in your current spending. You want to come up with a new budget, based on how much you need to recover (or pay off, if you went into debt). Start by cutting back on your non-essentials. What discretionary expenses can you give up? Look for small indulgences you can nix while you're in recovery mode. This might be your Friday night sushi fix, your morning Starbucks run, or anything else that's easy enough to cut. On the other hand, you do need some breathing room in your budget, and yes, that means leaving room for the occasional splurge. Cutting your budget too thin is not typically a smart idea, but an emergency budget should only be temporary, and you can slowly add expenses back in as your finances recover (if you even miss them once they're gone). You may have even received gifts in December that can help with some of these expenses: gift cards, extra cash — even leftovers. Be resourceful and make the most with what you have. Cutting back frees up some of your money to use for recovery. Now that you have your recovery amount and you know how much you can save, it's time to come up with a realistic goal for repaying your debt or replenishing your savings. To do this, set smaller, specific goals every month. On average, Americans say they spend about $US800 ($1098) on Christmas gifts alone, so let's assume your recovery amount is $1098. Shoot for a realistic time frame to pay that off, based on your own spending and income: maybe $357 a month for the next few months. Ideally, you've cut at least $357 from your budget in the previous step, and now, you can add your payoff goal to your newly reduced budget. If you depleted your savings account to pay for holiday expenses, replenishing it is as simple as transferring $357 into your savings account every month. Maybe you have other debts to take care of, too. Paying this new one might take longer, and it's time to come up with a complete, effective debt payoff plan or tweak the one you already have. Prioritise each one of your debts, and figure out how your recovery amount stands in line with them. Decide which debt you'll focus on paying first, fold this new debt into the mix, add the monthly payment to your budget, and draft a timeline of your total debt payoff. The best way to avoid holiday overspending is to prepare as early as possible. Yes, it's hard to think about next year's spending when you're still paying off this year's, but the earlier you get started, the better. You don't want a repeat hangover when December rolls around. Even if it's just a small amount, add a "holiday savings" category to your budget. You could even use a tool like SmartyPig to help you set specific savings goals. Another option might be to open up a separate savings account and transfer a certain amount from your paycheck each month. Whatever your method, the idea is to build a small fund that you have to work with next year. If anything, this gives you a limit. When you don't have a limit, it's easy to say, Well, I don't have anything saved, and I've already blown my budget, so I might as well go all out! We're less likely to overspend when we're working with a specific amount. This calculator from Clearpoint Credit Counseling can help you figure out a realistic holiday budget, depending on your income and monthly expenses. It offers a suggested amount to spend, based on your situation, but you can adjust the numbers if you want to budget more or less for next year. It's easy to feel guilty when you're hungover, but when it comes to your finances, guilt doesn't do much good. In fact, dwelling often makes the situation worse. Instead, focus on a solution. Coming up with a new budget can help, and so can declaring your goal and drafting a plan to carry it out. Ditch Pay TV for Netflix. Massive savings. Spend 10 minutes working out your meals for the week. Spend 2 minutes checking what you already have. Buy the rest in one trip to the shops when you are not hungry. "...and assuming a 10 per cent (credit card) interest rate..."
Huh? Please tell me where I can get a credit card with a 10% interest rate. I think both of mine are somewhere north of 19%. Is this another US-ism?